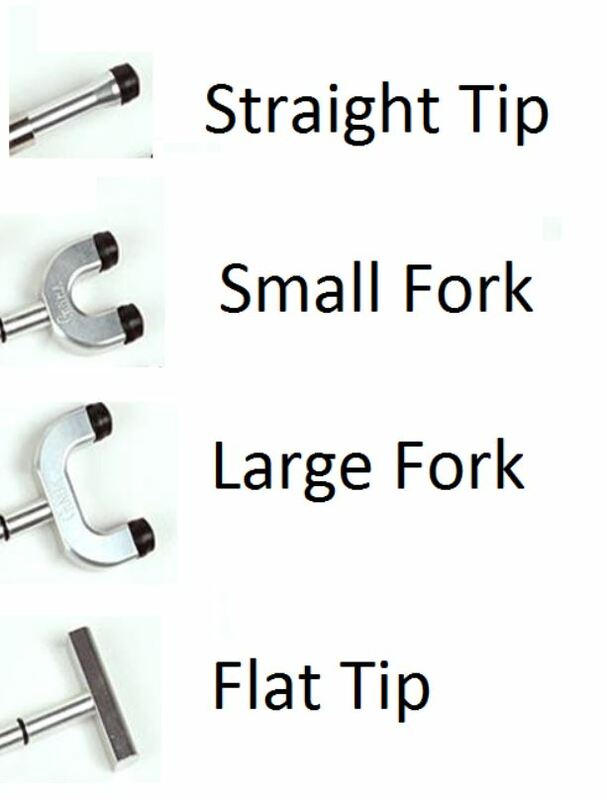 Styluses. The Chiro-Adjuster Instrument comes equipped with a single stylus and accessory Cervical and Lumbar Dual Styluses that are interchangeable within the device and can be purchased separately. The Chiro-Adjuster styluses are held in place by a small black o-ring found on the shaft of the stylus. If removal becomes difficult; a single drop of a light weight lubricant can be applied to the o-ring to reduce friction. Sewing machine oil can be found at crafts stores and unlike 3 in 1 oil has virtually no aroma. The Chiro-Adjuster neoprene tips on the ends of the styluses are replaceable should one fail. Force Adjustment Switch. 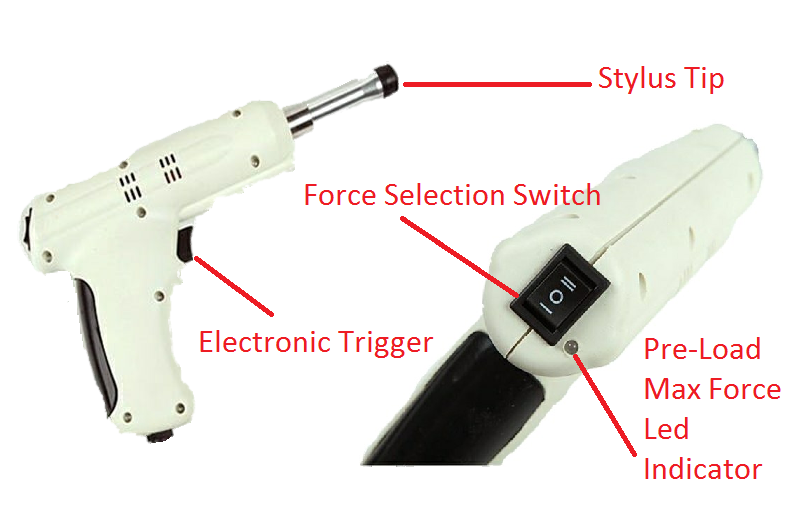 The Chiro-Adjuster force or the delivered thrust can be changed by means of a three position Force Adjustment Switch located at the rear of the device.It is located just above the handle grip on the Chiro-Adjuster. In the down position; the low force setting is achieved, delivering approximately 100N of force commonly used for the occiput, upper cervical spine, and on excessively tender areas. With the switch in the middle position; the medium force setting is achieved, delivering approximately 200N of force, commonly used in the lower cervical spine, thoracic and lumbar areas. Placing the switch in the up position activates the high force setting; which will administer approximately 400N that is more appropriate for the lumbar, sacrum, and sacroiliac joints. All three force settings on the Chiro-Adjuster have the same pulse duration, approximately 2 msec. The choice of force setting and/or single or rapid pulse thrust to be used is in the clinical judgement of the clinician using the device. Electronic Trigger. The Electronic Trigger on the Chiro-Adjuster allows the delivery of single thrusts or multiple thrusts. Pulling the trigger and immediately letting go will administer a single thrust. Holding the trigger down will initiate the rapid pulse mode where 12 consecutive thrusts will be delivered (6 Hz, 2 sec.). Once the Chiro-Adjusters rapid pulse mode is activated, discontinuation of the thrusts can be achieved simply by releasing the trigger, enabling the clinician to manually determine how many consecutive thrusts to administer as clinically indicated in the judgement of the clinician. Preload Control Nosepiece. Tissue compression, commonly known as a tissue pull in chiropractic techniques, is the preload applied while making segmental contact with the patient prior to the application of the thrust. The amount of preload to apply prior to the application of the thrust is in the judgement of the clinician. An LED light adjacent to the Force Adjustment Switch will turn from amber to green when the Chiro-Adjuster preload spring is maximally compressed providing visual feedback to the clinician that tissue compression has been achieved. Purchased One and it worked so well I got 3 more for each room!